WSBRC collects and collates records of all species, particularly protected and notable species from a variety of sources. We presently hold in electronic format over 2 million species records and over 5,000 site entries within our Recorder 6 database. Most of the data we receive is in electronic format, though often these need some processing before they are in a standardised form that can be easily added to our database. Records coming from online recording systems which can be verified at source, such as Living Record, are a small but steady component of these. Records are also collated and captured from PDF/paper sources, such as ecological consultant reports, on an ongoing basis but represent a relatively small proportion of the total. Of the records held, flowering plants represent around 42% of the total; this proportion has decreased in recent years from over 50% which is due in particular to increases in moth, butterfly, bird and mammal records held. 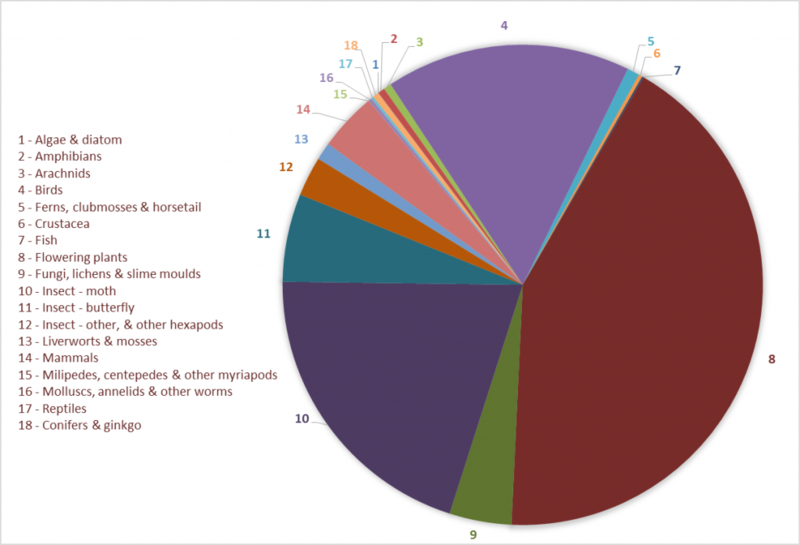 The approximate breakdown by taxonomic group for all records is represented in the pie chart and the table below. 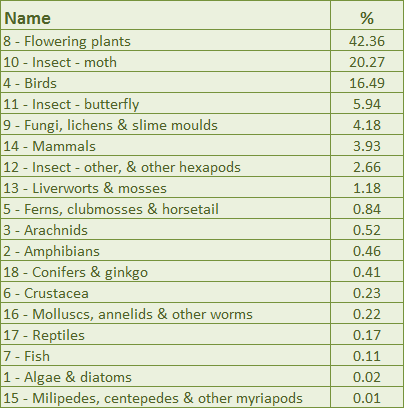 This chart shows the relative proportions of records in our database according to taxonomic group (some groups have been amalgamated for easier representation). Click on the image to expand. We are interested in records for all species occurring in Wiltshire, see Submit Records for more information.